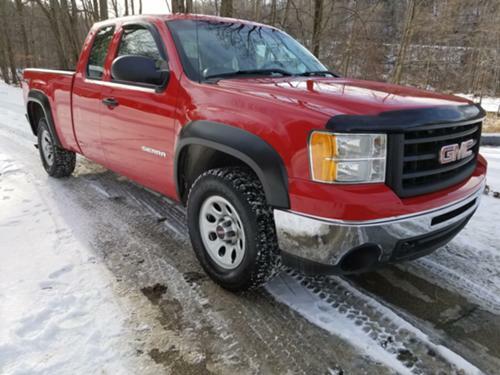 For Sale: 2010 GMC Sierra 1500 extended cab 4x4 WT with a 5.3 V8 engine, 6 speed automatic transmission and only 101,851 original one owner miles. This truck is in great condition inside outside and underneath. It runs and drives smooth, tight, and strong. Factory options include power windows, door locks, AC, tilt, and cruise. Also installed on the truck is a GM bed liner, GM fender flares, and a bug guard. This truck has been fully inspected as well as pa state inspected and ready for the road. If your looking for a nice GMC extended cab 5.3 at a great price then you don't want to pass this one by. TRADES ACCEPTED, please call Brian at 724-388-7034 with any questions or to set an appointment to inspect this truck.